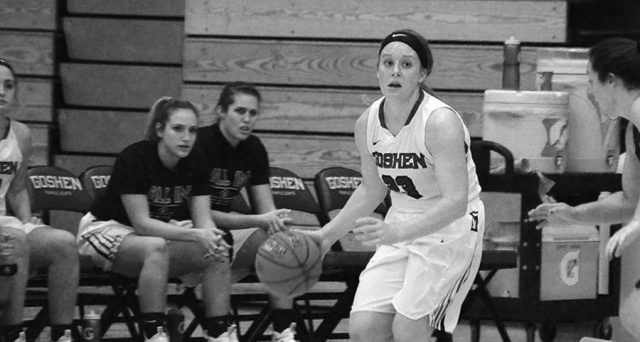 The Goshen College women’s basketball program fell twice to ranked opponents this past weekend in the Siena Heights University Thanksgiving Classic, first to SHU in a 72-52 defeat on Friday, and then 65-43 in Saturday’s consolation round against Indiana University Northwest. Both Goshen and 22nd-ranked SHU looked strong to open Friday’s game as they combined to shoot 20-for-30 (66.67 percent) from the field in the opening quarter. SHU led 31-21 at the end of the first quarter, then extended their lead to 44-28 by half. Sydney Stein, a junior, came just one point and one rebound shy of a double-double in the game while Mariah Roe, a first-year, kept pace atop the scoring column with nine of her own. Donnae Lipinski, a sophomore, backed up her recent career-high performance in the team’s previous contest against with seven of her own off the bench. Stein led all Goshen players with four field goals and brought down five offensive rebounds. Carley O’Neal, a senior, matched Stein, dishing a team-high two assists apiece. Goshen continued basketball action Saturday afternoon in a consolation game against 18th-ranked IUN. Chloe Salman scored a game-high 23 points for the Redhawks, including four made threes and four rebounds. Weslee Wilson added 14, while Alexis Blake came down with a game-high 12 rebounds for IUN. IUN scored nine of the last 12 points in the first quarter and went into halftime up 30-15. The Redhawks outscored Goshen 20-13 in the third quarter. The Leafs stayed tough throughout the afternoon as they closed the game on a 9-4 run, allowing just two field goals in the last five minutes. Goshen was held to just 13 field goals as a team. A lone bright offensive spot in the contest came at the charity stripe as GC converted on 14 of their 20 attempts (70 percent). O’Neal led GC with nine points, one more than Haley Archibeque, a junior, who scored eight and led the team with 30 minutes in her first start of the season. Stein added seven points and six caroms while Roe and Lipinski tacked in five apiece. The Maple Leafs will venture back into Crossroads League action this coming Wednesday as they travel to Indiana Wesleyan University (finished after print deadline) before trying their hand at another nationally-ranked opponent in the University of Saint Francis Cougars on Saturday. Tip-off in Fort Wayne is set for 1 p.m.